Laminate Wood Flooring looks good and is made to resemble the look of wood, stone or tile. Its durable because it resists scratches and stains. Laminates can be priced perfectly to suit your needs. There are many reasons why a laminate wood floor may be your best choice. Laminate is much stronger, more scratch-resistant and more durable than hardwood, vinyl or carpet. It is protected by a tough external layer and resin coating, making it compatible in houses where there are pets and children. Laminate Flooring is Easy To Install. Laminate is a lot easier to install than other floor types. Why? Because the boards are designed to interlock making them easy to work with. 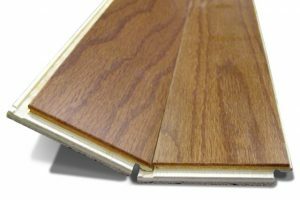 Laminate can be “floated” over most existing floors, saving significant installation time over other types of flooring which may need to be glued, stapled or nailed down. Over two-thirds of laminate is glueless click, further saving on installation time and cost. It’s so easy to install, most people can do it themselves. Laminate Floor Covering is An Economical Choice. Laminate flooring is relatively less expensive than most flooring options available in the market and yet does not fall short when it comes to form and function. There is a laminate flooring choice for every price range. Laminate Flooring’s Wide Choice of Quality. There are ways you can tailor your laminate flooring choice to your exact needs. If you have a truly high traffic situation like a retail store or another type of business, you can choose to spend more money on a thicker laminate with a higher AC Rating. Conversely, if you just want a nice living room floor and your living room will never see the kind of foot traffic a retail store will, you don’t have to spend money on thickness or a higher AC Rating. Instead, you can concentrate on getting the look you’re after. Laminate Flooring comes in a Wide Variety of Styles. Laminate flooring is sold in a wide variety of wood, stone and tile finishes. All of these are available in different colors, surface treatments, thicknesses and plank styles. Most laminate floors come with great warranties against wear, staining and fading. In other words, the manufacture is guaranteeing that their wear layer will stand up to years of use. You may even find some laminates with warranties against moisture meaning that their product is guaranteed to stand up to use in areas like basements and kitchens, etc although bathrooms are usually out of the question. Laminate Flooring is Easy to Clean and Maintain. Laminate flooring’s moisture and stain resistant surface makes cleaning of spills easy. There are no special cleaners needed to keep a laminate floor in top shape. Daily sweeping is all you need. Hypoallergenic Qualities of Laminate Flooring. Since there are no places to trap dust and other particles that can cause allergies for some people, laminate flooring is a great choice. The underlayment provides a moisture barrier that not only protects the floor from damage, but also prevents molds forming and sporing.